Krasnaya zvezda recently reprinted a column from the Northern Fleet newspaper about manning and contract service. It’s an interview with the chief of the sailor and NCO manning section in the fleet’s Organization-Mobilization Directorate (OMU), a Lieutenant Colonel Verbov. It’s funny (perhaps suspicious) because his name is the root of the word verbovat (вербовать) — to hire, enlist, or recruit. In any event, this LTC Verbov says his priority is manning the fleet’s submarines, and several years ago, submarines were manned at 98 percent — or “practically fully” with contractees. Since then, conscripts sent to the submarine force have served only ashore. The manning of billets which should be occupied by contractees is about 90 percent for the fleet as a whole. He adds, however, that officers lacking officer billets hold some of these contract enlisted positions. But the situation varies. In the Kola Mixed Forces Flotilla, third-rank ships are “practically fully” manned with contract sailors and NCOs, but first- and second-rank ships only 50-65 percent. Contractees are needed for those ships, and for Coastal Troops, Naval Infantry, and Naval Aviation units. Some 200-250 recruits are accepted on contract service every month. But this isn’t enough to solve his TO&E manning problems. Nevertheless, our Verbov says the Northern Fleet filled its quota of contractees at 96 percent in the last year. 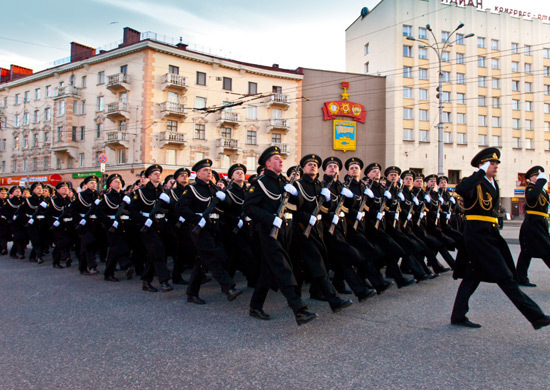 So ends a micro-level look at Russia’s military professionalization problem. Let’s see what the MOD is saying about the issue at the macro-level. The basic idea was to add 50,000 contractees per year, reaching a total of 425,000 in the armed forces before 2018. By the end of 2013, the MOD overfulfilled its plan by 27 percent, accepted more than 81,000 new recruits, and had more than 225,000 men serving on contracts, according to the annual report on Action Plan 2020. The goal for 2013 had been 240,000. According to Deputy Defense Minister Pankov, the MOD had 186,000 contractees at the beginning of 2013. If it added 81,000, it would have reached 267,000. So it must have failed to retain 42,000 contractees during the year, if it ended with 225,000. For completeness, we should note Defense Minister Shoygu said that the armed forces had more than 205,000 in November 2013. In December, President Putin said 205,100 (just to be precise). By early May 2014, the MOD said it had 237,000 contractees. That’s a good start for about four months. It wants to reach 280,000 by year’s end. For argument’s sake, assume it had 205,000, adds another 80,000, but also loses another 40,000. That leaves the MOD at 245,000 at the end of 2014 (i.e. the same number as the endyear goal for 2013). Again, ultimately, what matters for the success or failure of contract service is how many guys stay or leave the service.